A 3" X5" top spiral bound note book ideal for recording data on site. Printed on rite in the rain all weather paper . Contains 100 pages 1/4" rule horizontal lines with faint grid. 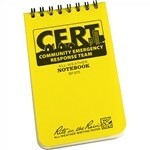 The 3 in x 5 in Community Emergency Response Team pocket notebook is ideal to record data on site. Printed on Rite in the Rain All-Weather Paper. 100 pages Universal Pattern.